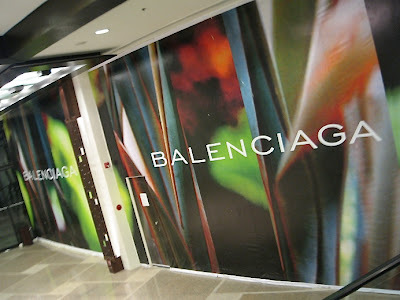 we thought it was just a rumor, but here's the proof: an actual balenciaga store being built in a corner of greenbelt 5. the view from the outside: the view from the inside: it's located by the escalators that lead to the outside facing ayala museum. we heard that the store—owned by jappy gonzales who also owns homme et femme, which carries balenciaga and other luxury brands—will open by late february/early march and will carry accessories with bags' prices starting at P70,000. we wonder, will we see any of those constructed floral suits too? wow it looks so big!! Will handbags be enough to sustain the brand? And if he sells clothes what will the prices be like? Good luck with that!! wow, exciting! This is a welcome surprise, thanks for the heads up! I can't wait, I looooove Balenciaga. Cheers! bonjour...jappy actually just left paris today..meetings with balenciaga among other business in the capital during fashion week. was also in milan. did you know that marnie ong, jappy's sister co-owns angels kitchen? 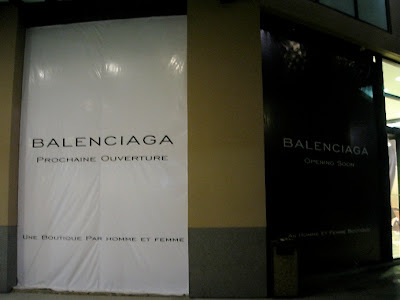 I'm so excited about the opening of Balenciaga in Makati *finally*! I've always loved the clothes, but I can't afford them full price *sob*. It's the sale (B @ Homme et Femme) that I am after :). I don't mind last season's clothes as long as they fit me AND they're more "affordable" :) I wish though that I can pay for B clothes without wincing... Even if they're on sale, they're still pricey. But oh, heart heart heart!